The e.l.f. Ultimate Blending Brush is specifically designed for advanced makeup techniques that help achieve professional looks. The large dome-shaped head and densely packed bristles maneuver in and around the crevices and contours of your face for seamless, even coverage. It picks up the perfect amount of product to build coverage with powder, liquid, or mousse foundation, bronzer, or blush. The ultra-fine synthetic fibers are hand cut, shaped, and assembled by artisans for expert craftmanship for a luxury experience. 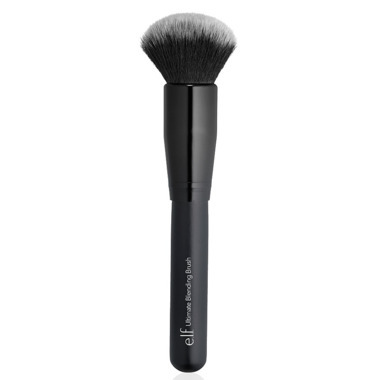 How To Use: Apply product to the face with brush and buff onto the skin in a circular motion. Continue to apply for fuller coverage. Very happy with this brush. I use it with liquid foundation and have no problems with streaking. I dab and swirl. I would definitely repurchase especially at this price point. Will definitely try other brushes by E.L.F. now. This brush is ok but not great for blending. It tugs at the skin so it may be better for applying moisturizer or base. This is a good quality brush for the price. It's soft and does a great job of blending liquid makeup. Would probably work well with powder also. I would recommend this product. For the price, this brush is excellent. No shedding, works really well for blending in foundation. Love it ! Its my go-to brush since i got it. Great dense brush, feels sturdy. I've been using it for powder foundation and blush, works wonderfully. Great brush, I bought it initiallly for blush, but works great for applying foundation. The brush is very soft , does not shed and the price is great! Best brush ever, especially for the price! Will buy more! Soft bristles, great for contouring! Perfect brush for a great price. Recommended !!! Really nice soft bristles. I would consider buying another one. THE perfect foundation brush. it is dense so i get the coverage i want and it smooths liquid foundation perfectly. and you cant beat that price! Great for blending powders and buffing product into the skin for a flawless finish. Nice soft bristles and perfect shape/size. This is a fantastic brush that blends my basic powder foundation and bronzing powder flawlessly. Great coverage. Easy to clean as well and holds its shape. Excellent quality for price. I heard about how good this brush was, so I decided to buy it. It is affordable and works as well as higher brands. It is soft and blends well liquid foundation. Good brush, soft and no shedding. I use it for blending foundation and it does a good job. Love this brush.vwill be buying more. I've purchased two of these now - one as a backup in case I haven't washed the original one and it's dirty. The metal wobbles a little bit at the attachment point to the handle, but I'm not fussed by it. You can use this brush for bronzer, foundation, blush etc. The quality for the price is fantastic and it is better than most of my Mac face brushes because it DOES NOT SHED! Highly recommend! This is a great brush that can be used for many different uses (powder, blush, bronzer, blending). Don't let the cheap price fool you...amazing. Wonderful brush! Very dense and so soft. I really like the size (not too big, not too small), and I was pleasantly surprised at how dense the brush is with bristles and how soft they are. I ought to buy another one! This is the best blush brush! It's very soft yet dense enough to really hold the blush. It's perfect for applying to the cheeks. I thought it would feel cheap or have too loose of bristles because of the price but I was tired of being disappointed by expensive brands so I gave it a go and was blown away! The very best powder brush, soft and fluffy, love it. I use this brush to put powders on. It is not bad based on the price.